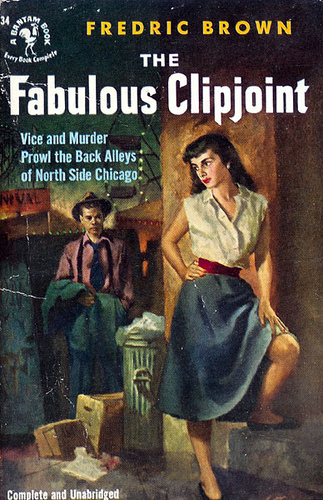 My pick for Forgotten Friday Books this week is THE FABULOUS CLIPJOINT by Fredric Brown. Published in 1947, it won an Edgar for Best First Novel. It was the first in the Ed and Am Hunter PI series, which ran to seven novels and a couple of short stories. Fredric Brown was a newspaperman by profession and was only a full time writer for fourteen years. He seems more known these days for his science fiction, though he has a considerable body of work in the mystery field. Ed Hunter is eighteen years old. He works in a print shop with his father. One morning, he gets up to wake his father for work and finds he didn’t make it home the night before. Not that concerned, his father likes to go out drinking, he figures he stayed with a friend. Then the police come and say he was found shot to death in an alley, apparently the victim of a robbery. The young man leaves Chicago to a town nearby, to see his uncle, Ambrose, and let him know about his brother’s death. Am is working in a carney set up in the town. Upon learning the reason for the visit, Am packs up and returns to Chicago. Formerly a PI, he’s determined they’re going to find his brother’s murderer. At the inquest, Am gets suspicious of a bar owner’s testimony and concocts a scheme to make them seem like hoods as they go about investigating. Along the way, Ed learns a few things about his father, a man, though he loved, he thought was just an old man, a drinker. You know, the way kids look at their parents. In his youth, he’d been a poker player, briefly owned a newspaper, fought a duel in Mexico over a woman, lived in Portugal and entertained a notion of being a bullfighter for awhile. As their hunt unfolds(after all, as Am said, “We are the Hunters!”), gangsters emerge, Ed meets an older beauty that’s tied into the whole thing, and things start to unfold. The solution surprised me and I’m ready to find the rest of this light-hearted series. I do know they worked for awhile for a detective agency before opening their own business. The first four novels are available in a single volume that was supposed to be followed by a second with the last three and the short stories. It never appeared. I go all the way back to the beginning with Star Trek. I was a geeky fifteen year old in 1965 when looking at the local paper’s weekly TV section. There was a still of Captain Kirk beaming in to publicize the show’s debut. I thought it looked interesting and tuned in that night to watch The Man Trap, episode one. I’ve been a fan ever since. I wasn’t as bad as some fans. I never cared whether people called us Trekkies or Trekkers. It’s not something to get pissed about. I didn’t attend a lot of cons(though I have met Leonard Nimoy and George Takei, as well as seeing a Lecture by Gene Roddenberry). I just liked the show and read the fiction before they just completely went crazy with the publishing program. These days I still occasionally read some novels. It depends on the writer and which show is featured. I never was thrilled with Voyager or the first three years of Enterprise. The writing could best be described as stale. I haven’t gone nuts because they are making a movie with all the original characters recast. I’m willing to give it a chance. Here’s a new version of the trailer with old Spock at the end. And yes, I’ll admit it. The inner geek thrilled a bit when I first saw it. I can’t help that. The show was a favorite in my formative years.